Recently, the Bike-sharing Blog had the opportunity to interview Alain Ayotte. He is the past President and CEO of Public Bike System Company (PBSC) and one of the creators of the bIXI bike-share system in Montréal. He led the design and development of this first modular “drop in place” bike-sharing system deployed in Montréal in May 2009. Soon after, this award winning system was deployed in Melbourne, Australia; Minneapolis, Minnesota; Pullman, Washington; London, England; Washington, DC; Toronto, Ontario; Ottawa, Ontario; Boston, Massachusetts; Chattanooga, Tennessee; Stony Brook, New York; New York City, New York; Chicago, Illinois; Columbus, Ohio and Aspen, Colorado. In February 2013, he left PBSC Urban Solutions. He can be considered one of the founding fathers of Bike-sharing in North America. Bike-sharing Blog: So after you left PBSC what have you been doing? Alain Ayotte: I needed some time off to reinvigorate myself and spend time with my family. Then I quickly realized that I wanted to continue to contribute to the urban mobility field. It is a field about which I am passionate and where we really can have an impact on people’s lives. I could no longer do so in my previous role and that was the main reason which led to my departure. B-s B: Tell us what does Bewegen mean? From where does Bewegen come? Ayotte: As you can imagine, the naming of our company was one of the first tasks we tackled. Hours and hours of research and brainstorming went into finding our name. We wanted to pay tribute to the Netherlands as the pioneers of bike-sharing and of bicycle commuting. We decided on this unique name: Bewegen. Bewegen is simply the verb “to move’’ in Dutch and German. We integrated a lightning bolt into the word to make our logo and to link it with our product. B-s B: Being an innovator in the bike-sharing industry, you helped create a solar powered bike sharing system with modular docking stations which can be picked up or put down in 20 minutes. This facilitated the ability of removing an entire system from the street during harsh winters and reduced the cost of installation for electrical hook up. This changed the way North American cities deployed bike-share which now has been copied throughout the world. Innovations have been the hallmark of your work. So with your new system what innovations are you bringing to the world? B-s B: When will we be able to see these Bewegen bikes and stations? Ayotte: We will officially unveil our product in early September at Pro Walk/Pro Bike/Pro Place in Pittsburgh, PA. The Bewegen team and its partners will be happy to show and explain it to whoever will be present. As far as full scale implementations, we will be ready to hit the streets of cities and towns in summer 2015. 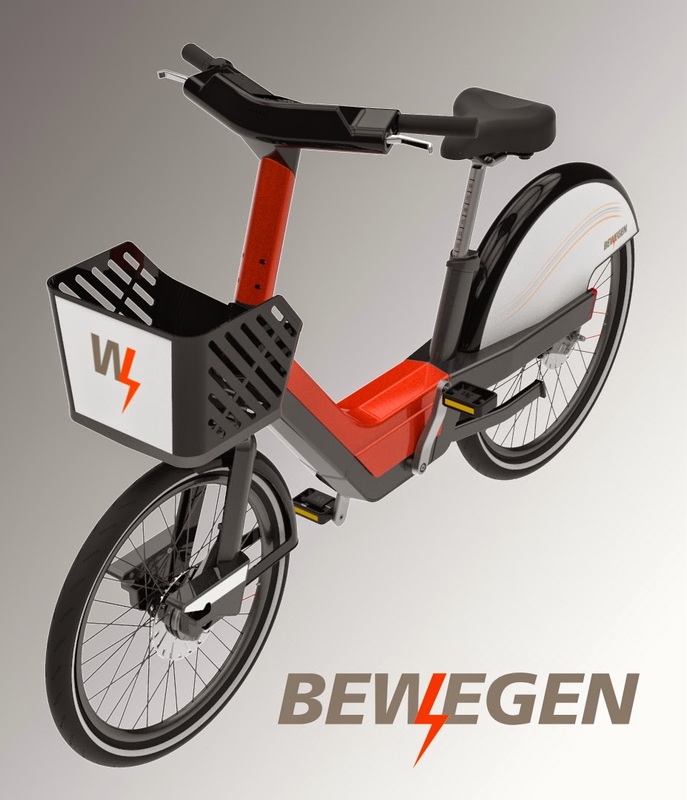 B-s B: We know that the future of bike-sharing is going toward “pedelecs” (pedal assisted electrically powered bicycles). Copenhagen, Denmark and Madrid, Spain started pedelec systems this year, Barcelona will add pedelecs to its fleet this December. Rome just issued a tender offer for a pedelec system. Many Italian cities now have mixed bicycle –pedelec programs. Do you believe that pedelecs will ultimately replace or augment all current bike-share systems? Ayotte: Conventional bike-sharing was good a start, but has many limitations. The modal share numbers speak for themselves. They limit the impact that bike-sharing can have on the urban transportation mix of a city. This also limits the pool of riders and the types of use they can get out every trip. I believe that shared pedelec (electric-assist) vehicles are truly the missing link in urban mobility and will soon become the norm. B-s B: So tell us how do cities planning bike-share or cities with existing bike-share programs plug into this electrifying change for bike-share?